I last wrote about China's Shanghai Index in my post of June 19. 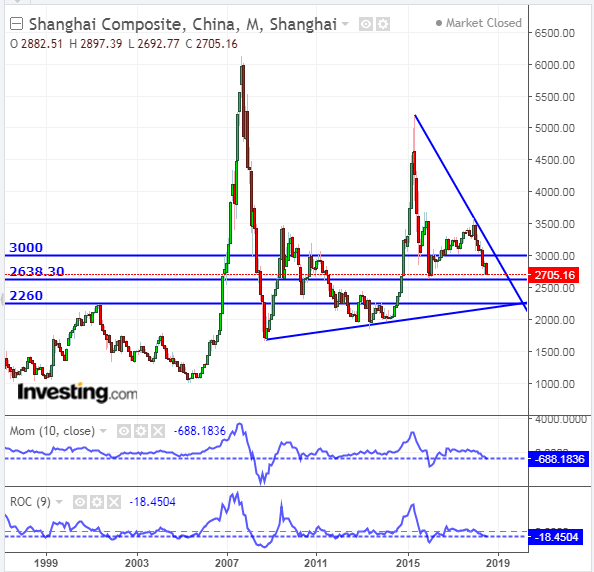 This index is in bear market territory and is headed toward its last (monthly) swing low of 2638.30, as shown on the following monthly chart of SSEC. A break of that level could see a swift drop to its next major support level of 2260, or lower. Both the momentum (MOM) and rate-of-change (ROC) indicators are below the zero level and are accelerating to the downside on this timeframe. Watch to see if they make a new swing low below the one made in February 2016. If so, this index could be headed for major problems, and the increasing trade war with the U.S. is not helping.